Previously KSS only had editor support in Vim. This made the kitchen sink of editing a bit jealous. Fortunately we now have a Emacs mode for KSS. 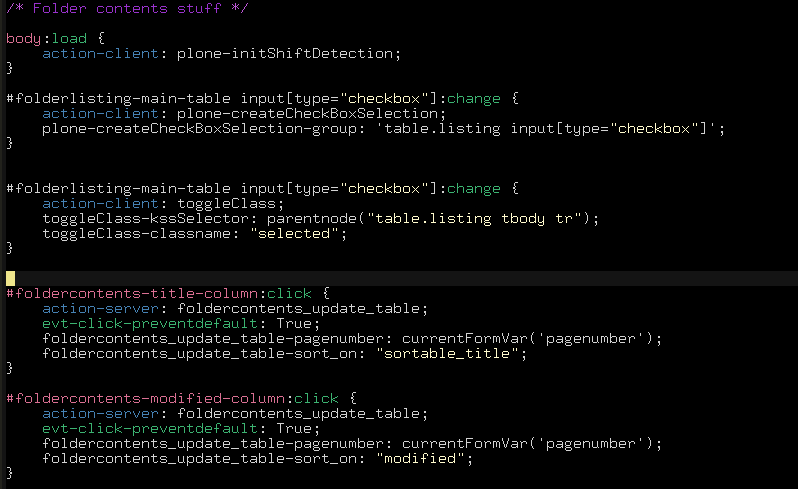 I had one problem with getting the highlighting for CSS selectors to work with complex ones (see the screenshot). If there are any Emacs wizards out there willing to help that would be greatly appreciated. We started with the KSS sprint today. One of the first improvements is that base2’s CSS selector is now usable with KSS. This means that all applications using KSS will get a nice speedup (base2 should be a lot faster than the original CSSQuery). The fix for this entailed change the protocol between the client and the server. In the previous version the data communicated would be structured XML. This caused problems because the DOM extracted from this contained namespaces (which broke XPath). Our new protocol transfers data as string’s (either within a CDATA or in a text node). As a side effect of this the DOM injection/replacement actions had to be changed. Because the code previously had to deal with either DOM or string data we could clean it up quite a bit. This means a leaner and meaner KSS. A thing I worked on by myself was merging the pure Python packages for KSS into one package. This new package will probably become the base for a new kss.zope package which will (with BBB) replace kss.core. The kss.pylons pacakge is already changed so that it now depends on kss.base instead of the separate packages.